Found Here Tonight Tin Thermometer - Licensed Artwork, Four-Color Process, Weather-Proof, Indoor/Outdoor - 5”X17” | BUDK.com - Knives & Swords At The Lowest Prices! 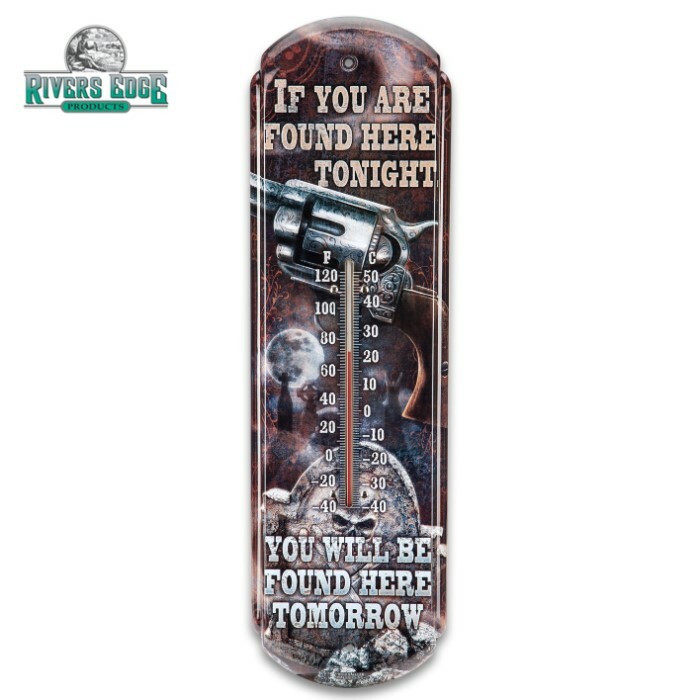 This great looking, nostalgic tin thermometer serves as both a thermometer and a warning sign to intruders! The “If You Are Found Here Tonight, You Will Be Found Here Tomorrow” artwork is a licensed piece by a talented artist that is protected by a fade-resistant finish. The superior quality thermometer is manufactured with a durable four color process that will stand up to whatever environmental conditions Mother Nature can dish out and still retain its vibrancy. The 5” x 17” tin thermometer adds an extra touch to wherever it is placed!